Founded in 1979, Phase Eight offers womenswear, shoes and accessories with a feminine touch for every occasion in over 430 stores and concessions globally. 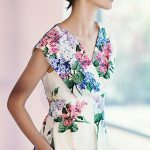 The products lines are split in the day wear range and the occasions collection, all reflecting the design philosophy of Phase Eight that transcends all ages: exclusive designs, beautiful fabrics and unique prints. TASK represents Phase Eight in Germany.